Designate a relative or friend as an out-of-area contact with whom family members can relay information. Review and update your emergency supply kit periodically. Learn alternate ways out of your neighborhood, in case the usual way becomes blocked. Plan how to transport your pets. Click for information on evacuating horses to the Del Mar Fairgrounds. If you have horses, pre-fill out this mandatory evacuation form. Your kit should consist of supplies stored in easy-to-carry containers such as backpacks or plastic crates. A three-day supply of water (one gallon/person/day) and food for people and pets. Change of apparel plus blankets/sleeping bags. First aid kit, prescriptions, toiletries and specialty items for infants, elderly and disabled. An extra set of car keys, flashlight/batteries and battery-powered radio. Important documents such as copies of insurance policies, identification and bank accounts. Review FEMA's list of how to obtain replacements for important documents. Obtain more emergency supply kit information at Ready San Diego. Step 3: Stay or Go? During an emergency, you may be required to evacuate or to stay where you are. Sign up for Alert San Diego to receive information sent directly to your mobile device and email. Listen to your radio/TV (KOGO-AM 600 and Encinitas 1500AM) to stay informed of potential evacuations. Follow recommended evacuation routes. Do not take any shortcuts as they may be blocked. 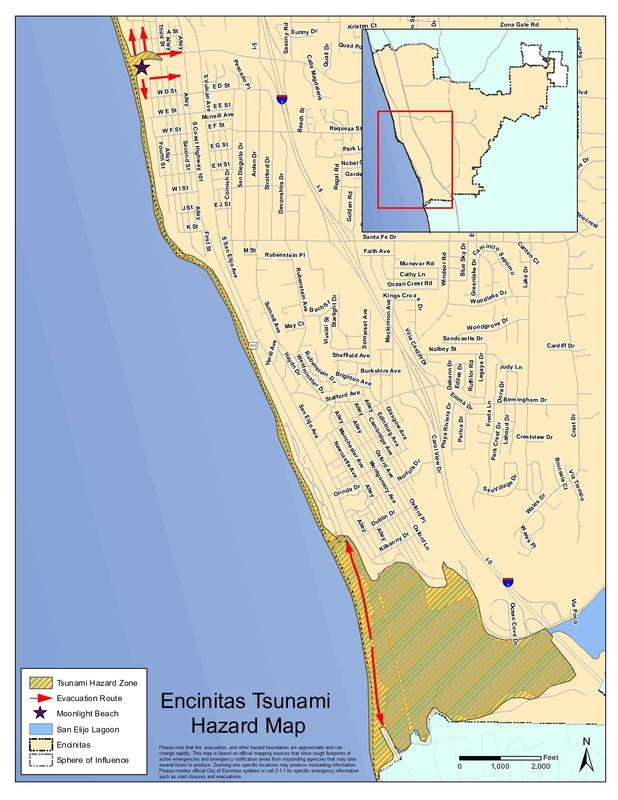 Click for information on tsunami and wildland fire evacuation plans. Avoid non-essential cell phone use. Text rather than call during an emergency. Messaging is more resilient in a disaster than voice communication. Let loved ones know you're safe. After a disaster, register yourself at the American Red Cross' Safe and Well website so family and friends know you are okay. Visit the City of Encinitas website and San Diego County emergency site for up-to-date information. Follow the Encinitas Fire Department on Facebook and Twitter. Check the CA Department of Transportation website for road conditions and closures. Download the San Diego County Emergency App to receive real-time information during a disaster. Take advantage of additional emergency preparedness resources listed below. Additional preparedness information and classes are available to residents upon request. Please send us an email by clicking here or call 633-2815 if you would like further information or would like to schedule a class or presentation for your group.